Back in the mid 7os, when made for TV movies were the rage, Linda Blair starred in one called Sara T: Portrait of a Teenage Alcoholic. I’m sure it’s incredibly cheesy now, but I remember thinking that it was shocking and heart-breaking back then (and, yes, I realize I’m dating myself!) See for yourself. I love the fact that all this stuff turns up on YouTube! 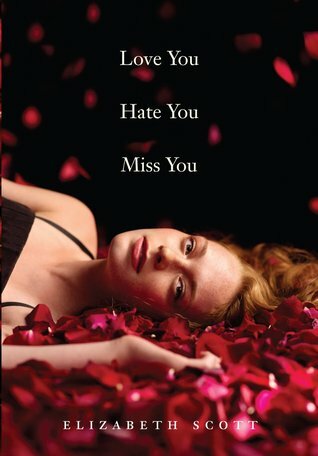 Love You Hate You Miss You by Elizabeth Scott is an updated take on teenage drinking. It tells the story of Amy whose best friend, Julia, has been killed in a car accident that Amy feels wholly responsible for. At the start of the book, Amy is just being released from Pinewood, a teen treatment center. She’s back home with her parents, high powered people from whom Amy has always felt distant. She has to return to school and continue to see her therapist, who insists she ask and answer some hard questions about her relationship with Julia. Some of Love You Hate You Miss You is written in the form of letters to Julia. Amy’s therapist thinks it would be a good idea to journal her way to recovery, but Amy decides that she’ll write to Julia instead. The rest of the novel is a first person account of Amy’s attempts to fit back into a life she never really fit in to before. Instead of a ‘movie of the week” feel, though, Love You Hate You Miss You seems authentic. Amy is 16 and she sounds it. She is trying to make sense of her life, but now she has to do it without her best friend. She drank because it made her feel less awkward, more confident. Of course, the truth is alcohol just masks things temporarily – when the high wears off, you are who you are. Amy has no choice but to come to terms with her parents, her life and herself and Love You Hate You Miss You allows that to happen without talking down to its intended audience. Now, I think I’ll re-watch Sara T! This entry was posted in Uncategorized and tagged 2011, teen by Christie. Bookmark the permalink.